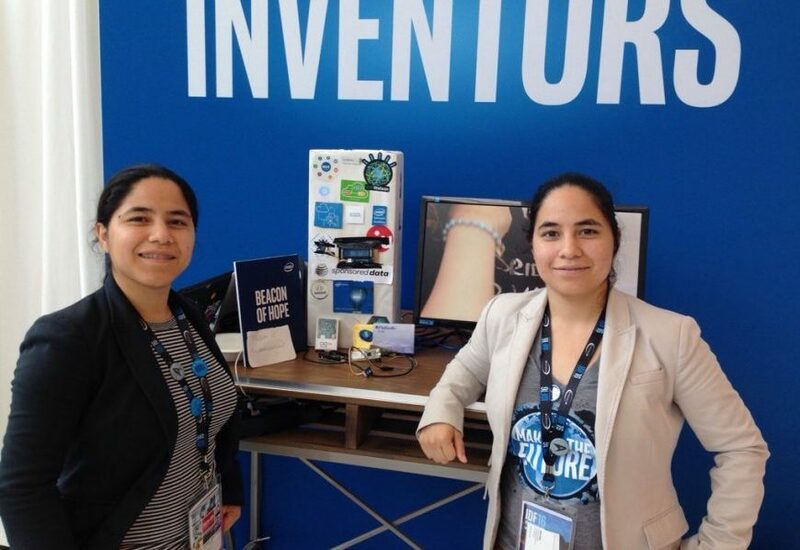 Twin sisters America and Penelope Lopez didn’t start coding until they were in college, but they quickly established themselves as award-winning innovators known as the “CyberCode Twins.” Having developed an impressive array of apps and tech projects, America and Penelope have more recently begun working in the world of cryptocurrency and blockchain as well. Their current work is focused on using blockchain technology to further social justice and humanitarian issues. A day before flying out to Puerto Rico to help work on mesh networks as part of the island’s ongoing hurricane relief efforts, the effervescent duo joined MindMeet from their sunny backyard in L.A. to chat about the new frontiers of technology. CS: What’s the overarching philosophy behind your work? PL: And with the community. AL: Yeah. We’re not only technology advocates, we’re also community advocates. We want to bring technology to underserved communities because they need to be part of the solution as well. We’ve been on neighborhood councils in Los Angeles so we’re very familiar with different governmental procedures. I was also recently at the United Nations for a project called Blockchain for Social Impact, which was focused on financial inclusion and how to serve vulnerable populations. Primer: CRYPTOCURRENCY—such as Bitcoin—is a digital, virtual, alternative currency that is completely decentralized (i.e. operates without a central banking system). BLOCKCHAIN is the secure, decentralized digital ledger that’s used to track the crypto-economy without the need for a third party. Blockchain technology also has the potential to be used for all different kinds of digital record-keeping too, including medical records, changes of ownership, voting, and more. Both cryptocurrency and blockchain are new ideas that radically challenge the current status quo. They represent an uncharted frontier for the digital age, and, thus, both their potential and their longevity is not yet fully known. CS: How did you make the transition into the world of blockchain? AL: We’ve been involved in the blockchain space for about two years. The reason I first got into blockchain was because of our Beacon of Hope project. Beacon of Hope is an idea for a discreet intervention device for victims of human trafficking, although we’re also in talks about how to modify it to help with the opioid epidemic too. The project is focused on restrooms, where trafficking victims are most often left alone. Our aunt actually escaped from a human trafficking ordeal, and she told us that during that time she felt very disheartened whenever she saw a sticker that said “call this number or visit this website for help.” That just doesn’t make sense for someone who’s in that situation and doesn’t have access to a phone or a computer. We don’t have payphones anymore—that used to be the social safety net, but now they don’t exist. So what can these trafficking victims do to ask for help? So our idea is to have bathroom dispensaries—for things like pads or aspirin—be smart dispensaries that can deliver a device that can help trafficking victims communicate in their time of need. And blockchain comes in as a way to analyze the data and make it immutable so you can use it in court. I initially learned about blockchain and cryptocurrency through the MIT Digital Currency Initiative, and now we’re in talks with the U.N. on how and where to fund a Beacon of Hope pilot program. Getting the funding itself isn’t necessarily the problem, we just want to make sure we do it the right way. Blockchain is only as good as the data you put in. CS: How do you explain blockchain and cryptocurrency to a skeptic? AL: That’s the same question my parents asked me two years ago! They were like, “Isn’t this what the mafia is involved with? Why are you getting involved with this?” And I told them that the crypto-economy is just like the sharing economy except that it isn’t based on debt. I had blockchain explained to me in emojis. I wish I had an emoji right here! When talking to people who don’t understand blockchain, I explain that it’s basically an open source protocol that should’ve been included in the birth of the internet. That’s why you have third parties today like PayPal and Amazon Pay, because we left it to third parties to do those transactions. So it’s the missing protocol that the internet should’ve had in the first place. CS: So what emoji would you use to sum up the importance of the blockchain movement? AL: The heavy metal hand sign! [Laughs.] It’s definitely a wild ride! It’s very early. For some people it’s just not the time for them to be involved. And for other people it’s like, what option do they have left if their economy has failed them? CS: How has cryptocurrency changed your world? AL: To us it’s very personal because our parents were victims of the predatory lending schemes happening in 2008, and those predatory lenders were never held accountable. I think if blockchain technology had been around back then, not as many people would’ve been hurt. Luckily, after fighting with the banks for about 10 years, we were one of the few families that were able to keep our home. But only due to the sharing economy and the crypto-economy. How do you think cryptocurrency and blockchain technology could potentially change the world? AL: I feel like it will change more outside the U.S. than in the U.S. itself. I have to put that into perspective. The First World perspective might not get changed that much by crypto. But outside of America, the attitude towards crypto has definitely changed. Countries are taking it as a national security issue. And they are getting very involved in this new economy. The crypto-economy could have a big impact on people who are unbanked, on families in Africa, on people in Puerto Rico who were affected by Hurricane Maria, on indigenous tribes. For example, an indigenous community might grow certain plants, and then pharmaceutical companies come and genetically edit those plants. 10-15 years later there’s a miracle cure and the company grabs all the profits while the indigenous community doesn’t get a single cent. Being able to track all those different genetic edits on a blockchain would allow indigenous tribes to actually profit from their work. So it’s about being more equitable and addressing the insane wealth gap we’re seeing in the world. So that’s the biggest thing: How do you create sustainable humanitarian efforts through this technology? And we’re starting to see pilot projects go from pilot to actually building a great, sustainable effort. CS: Since your careers are so unique, I’m curious what your day-to-day schedule looks like. AL: It’s almost semi-nomadic. It can be difficult for our parents to understand. AL: I always tell people that in the shift to the open economy, your job’s not outsourced, it’s open-sourced. You’re going to be working on collaborative projects that need input from different community advocates. So it’s definitely a shift in perspective. It’s less like a traditional job and more like an open-sourced community that you’re part of. And, actually, that’s the way I look at blockchain too. It’s one of the few open-sourced projects that actually pays its community members. So it’s very different than previous online communities like Facebook and Twitter, which don’t pay their users. We’re shifting that mindset as well. CS: For those who are still confused by the idea of cryptocurrency and blockchain, what resources would you point them towards? AL: We’re actually currently working on a children’s book explaining blockchain through emojis. That was recently funded, so hopefully that will be out soon. But one of the biggest things I recommend is watching the documentary Banking on Bitcoin. That really helped my parents understand. And I definitely recommend reading the white paper of Bitcoin. It’s only eight pages! I don’t know why people think it’s so long. What else do you recommend, sis? PL: Just try exploring wallet apps and learning how cryptocurrency works. AL: And sign up for an account on the crypto-blogging website Steemit. That’s another way. PL: You get paid for learning! AL: I told my professors at MIT that I didn’t know how I could ever pay them back for what they taught me, and they gave me a short answer: “You have to pay it forward.” So now we want to help educate people about different ways they can earn income from crypto projects. Caroline Siede is a pop culture critic in Chicago, where the cold never bothers her anyway. Her interests include superhero movies, feminist theory, and Jane Austen novels.